So today was a special day for the Jones family. Today was our first day at Idlewild as a family of three. Our church has been a huge part of our lives as individuals, as a couple, and now as a family. Church is where we met and fell in love. It's where we were married. It's where our closest friends come together as a family to worship. And today we had the blessing of taking our son with us. My prayer is that he will love God and the church just as much as we do. I've been looking forward to this day forever and I am so thankful God allowed it to happen. We had a rough night last night and it was clear that satan was gonna make it hard for us to get there, but God is faithful and we made it-on time no less! We (read, I) was never on time when I didn't have a baby! 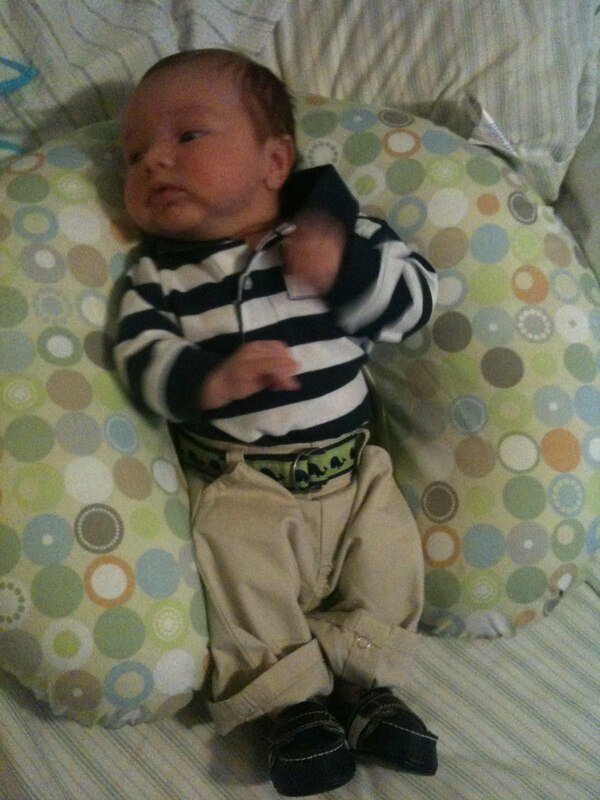 Here is our little guy all dressed for church. I know I'm biased, but I think he looks pretty stinkin' cute! First we went to our Bible Fellowship class where our sweet friends were so happy to see him. Of course Uncle Flip had to hold him for a bit! He did pretty well, although he got a little fussy around feeding time (surprise, surprise)! Then we went to the service where we saw Ms. Margaret and Mr. Stu who took some sweet pictures of Jax during the worship time. We decided to keep him with us this week during the service but starting next week he'll go to the nursery and hopefully make some new friends. 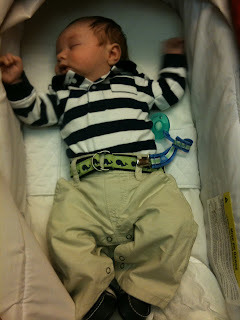 Jax fell asleep finally and slept through most of the service (sorry Pastor Ken, he doesn't get that from me!). I think he was excited to see so many people he fought it for a while and afterwards, he was out like a light. We picked up some lunch and headed home for the day. Jax was still asleep when we got there, but of course woke up AS SOON AS I sat down to eat! I got up and started feeding him, during which he loaded his pants with a special present for mommy. It was everywhere. So we (it took 2 of us!) got him all cleaned up and I finished feeding him. An hour or so later I finally got to eat lunch. It was cold, which I have a feeling is how most of my meals will be now that I am a mommy! Then he and I settled down for a nice nap. I decided that Jax is a true Baptist at heart, seeing as he took a nice 3 hour nap after church and lunch! We are so thankful for our wonderful church and look forward to many more Sundays there as a family!